MOLINE, Ill. — Furniture Mart USA recently opened its 26th Ashley HomeStore here, its first in the state, serving the Quad Cities region in northwest Illinois and southeastern Iowa. The nearly 34,000-square-foot showroom at 4500 16th Street — the Sioux Falls, S.D.-based Top 100 company’s 26th HomeStore — features an array of Ashley furniture as well as a dedicated sleep shop with more than 40 mattress including Tempur-Pedic, Sealy and Ashley Sleep brands. 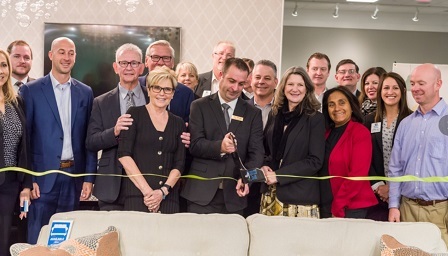 “This store marks an incredible occasion for our Ashley HomeStore division with the opening of our first location in Illinois,” Furniture Mart USA CEO Jim Heinitz said. In conjunction with the store grand opening, the retailer donated 25 twin size mattress sets, including linens and pillows, to Bethany for Children & Families of the Quad Cities, which will then be given to local families in need, as part of Ashley HomeStore’s Hope to Dream Program. “We are always happy to give back to our local communities and the Hope to Dream Program is just one way in which we are able to do that,” said Tom Kovash vice president of Furniture Mart’s Ashley HomeStore division.